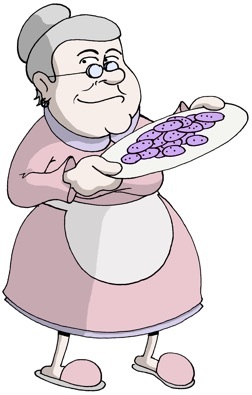 This Purple Cookies story, before it even had been written, was the impetus for inventing the Popcorn Stories literature category. Well, suddenly I'm told I have high cholesterol and a bad heart. But I didn't want to give up my cookies. "Is it worth it to continue eating cookies?" I wondered. (I really like cookies, you see.) "Or is it worth it to never ever eat a cookie again and forever have a stronger and stronger urge to have a cookie?" Cookies are my friends. I won't give them up. Not ever! "Maybe I can find a healthy cookie recipe," I thought to myself. Although I looked and looked, I couldn't find a good one. So I decided to create a healthy cookie recipe. For the cholesterol, no egg yolks. For kindness to my heart, only whole wheat flour and no processed sugar or manufactured sweeteners. It was trying. Every experiment yielded unsweet cookies. And who wants an unsweet cookie! Experiments with fruit juice concentrate, apple and orange, added enough sweetness to be borderline. A person could get used to it. Actually, they tasted pretty good. But not good enough, not quite what I had been salivating for. After testing and testing, I finally hit the jackpot — concentrated Concord grape juice. The cookies bake into a festive purple shade. They are fun to eat and wonderfully delicious. You can about taste the cookies just looking at them. The color is so inviting, and they look so scrumptious arranged on a plate, that folks just gotta try one. And then another. And can't quit until the plate is empty. Use this form to send a private note to Will Bontrager, the author of Purple Cookies.